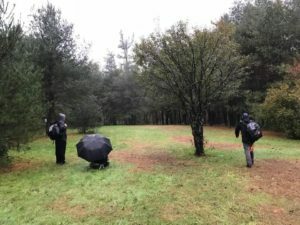 As the fall gives way to winter and tournament season winds down- New England Team Challenge is now upon us. 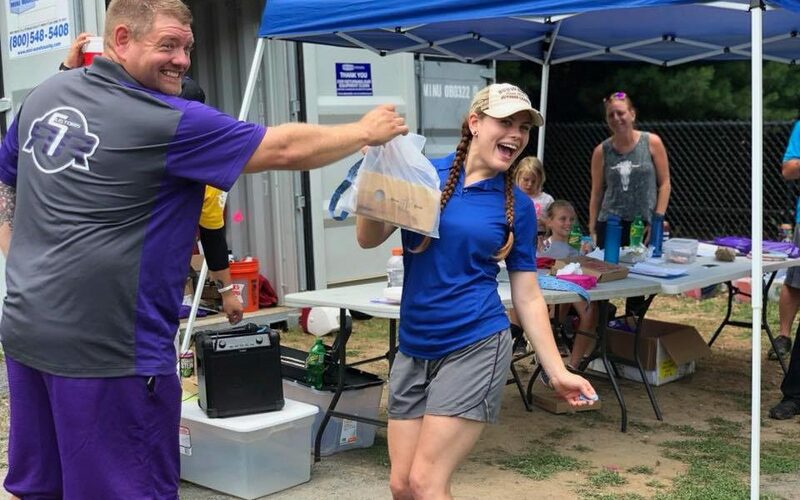 Last year the Dacey Owls season ended in the first round of Play in Pool finals to an eventual South division champion Disc Hut 2, but the finals berth earned them a promotion to the newly formed E Pool for this season. Joining the Owls is a new team- The Ents – captained by Paul Sales and Nick Berry. Both teams have kicked off their seasons, so let’s see how they have been doing! 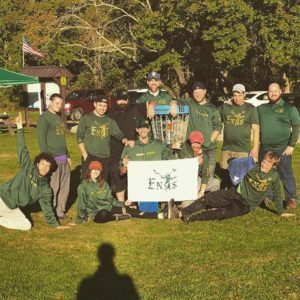 The Ents kicked off their season on October 6th on the road against the Newton Hill Talons. The Ents jumped out to an early 9.5-7.5 lead highlighted by big wins from Brian Lively (7&6) and Will Duby (7&5) and a dominating showing by the lady Ents Caley Allen and Bri Reeves (8&6 & 7&6 wins, respectively). The Ents extended their lead in the doubles rounds in part due to matching hot round 49s from the Ben Tucker/Tony Lyons and Paul Sales/Alex Mahnken pairings to win their inaugural match 19.5-14.5. The Ents stayed active on the road traveling to Middleboro on October 20th to take on the newly formed Sunnymeade Knights. The Ents found themselves down 2 going into lunch despite another dominant performance from Bri (8&6 victory) and an 8&7 victory from Terry Belmosto. The Ents not only overcame the deficit, but also a match up mess up from the opposing captain to win the match 17-15. 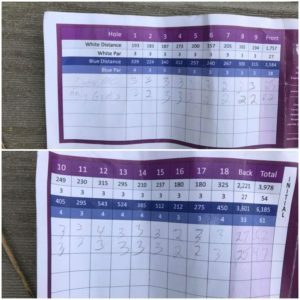 The match was closely contested and came down to the final card where the Zack Pepin/James Thomas pair sealed the deal in extra holes to tilt the score in the Ents favor. “We’ve been incredibly impressed by the dedication shown by the team so far. All of our players have had difficult matches against tough competition on the road, and everyone is answering the bell. It feels great to start the season with 2 wins on the road, but we know it will only get harder from here” said captain Paul Sales. 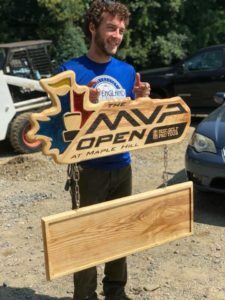 ” The camaraderie, sportsmanship, and positive mentality is contagious. Both teams contain amazing individuals who all contribute and push each other to excel,” added Co-Captain Nick Berry. The Ents are off for the month of November. Sitting at 2-0 before even taking to their home forest, the Ents are establishing themselves as the team to beat in PiP South. 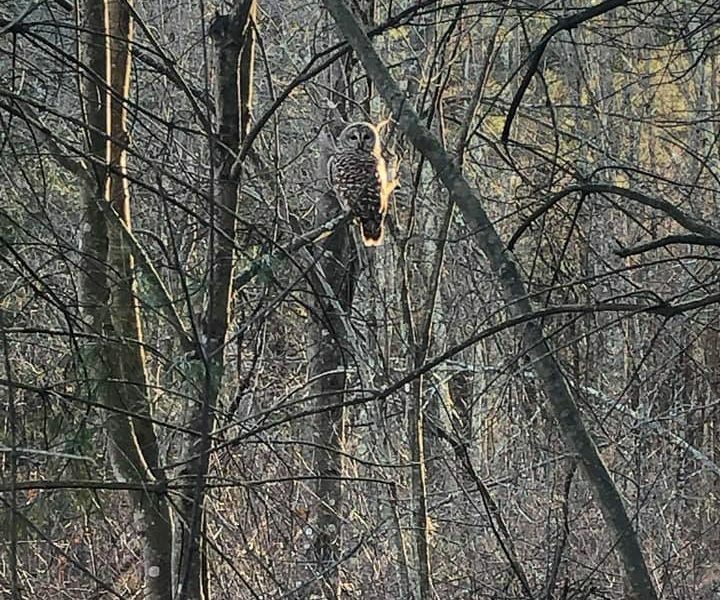 The Owls started their season a little later, opening up at home on October 27th against a strong Bittersweet Ridge team from Maine. 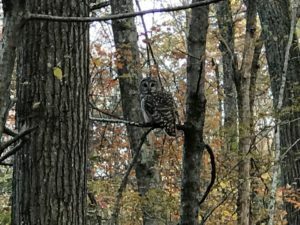 Not only did the Owls need to contend with a capable squad, but they also needed to battle the elements as a Nor’Easter rolled into town bringing driving rain, and ripping winds from sun up to sun down. It was way worse than it looked. The Owls split the doubles round with BSR, each side taking 10 points a piece. 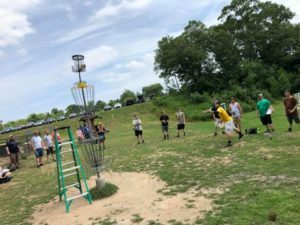 The Owls got wins from the Jeremiah Libby/Dave Leger, Nate Lundstrom/Corey Robitaille, Greg Dowdell/Andy Jong, Paul Pacheco/Dave Beadenkopf and the Alex Sakash/Tara Scansaroli pairs to take the match 22.5-17.5. A win means the flag flies! 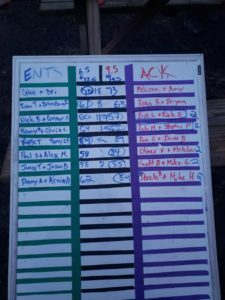 Not only were 40 brave (or stubborn) souls out on the course competing in that weather, but a handful of Dacey regulars stopped by to lend a hand setting up, writing on the board, and caddying. “We had so many non-team members out yesterday to support us, it was humbling” said captain Chuck Edman. Members of the Ents as well as a few Dacey regulars came out to cheer on the Owls, and their support was much appreciated! 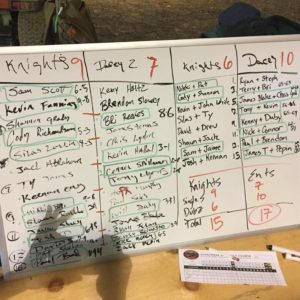 Teams Dacey look to maintain their perfect 3-0 combined record in the coming months. The Owls head north on November 11th for a match in Maine against Devil’s Grove. This is going to be the biggest test of the season for the Owls, as Devil’s was the top seeded team from the North division last year at 7-1 and is tough at home. The Owls will be home again on December 8th to take on Team Rhode Island looking to even up the series with RI after dropping their match at South Kingston last November. The Ents will finally be taking to home turf on December 15th, when they welcome Team Nantucket to the mainland. This will be third time Nantucket has played against a team from Dacey. The Owls beat Nantucket at home in a blizzard in 2017, and then won an overtime thriller last year on the island. The Ents hope to continue their hot start and carry on the courses winning ways against Nantucket. 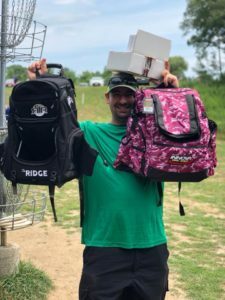 The 2017 Dacey Trilogy Challenge was one of the more enjoyable events at Dacey last season according to our player survey we put out earlier this year, and 2018’s edition was just as enjoyable! 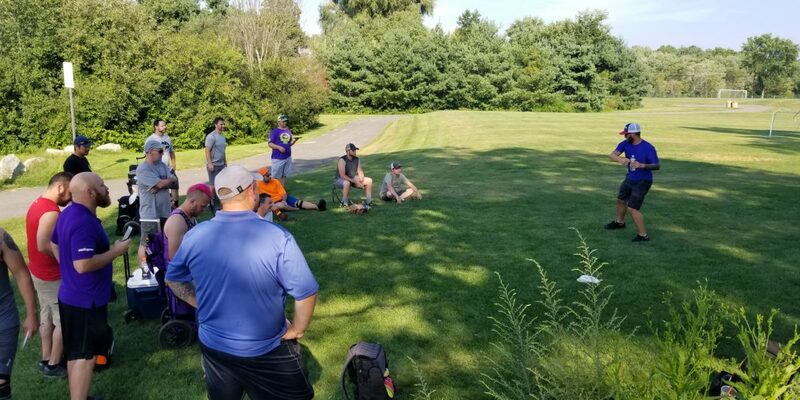 We had another full field, and gorgeous weather throughout the day as we all tested 3 new Trilogy molds in a laid back, yet competitive environment. This year the three discs were the Westside Discs putter the Maiden, Dynamic Discs midrange the Patrol, and Latitude 64s driver the Musket. It seemed as though many people we happy with the putter, were relatively neutral on the Musket, and were very split on the Patrol. Feel free to comment your feelings on the three offerings! *There was a FIVE WAY tie for second! 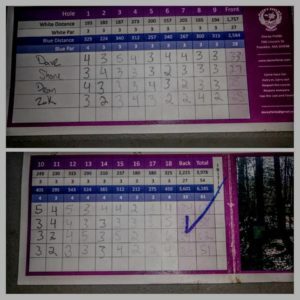 Christian took sole possession of second with a birdie of hole 1 in the playoff, and Chris took third overcoming a tree kick off his drive on hole 2 to save par. Jason Boucher bests Nick Berry and Dave Leger in a throw off for third place 65. Crazy how 3/4 divisions were won with the identical score! In addition to the round, we offered a number of field games for additional raffle tickets. We brought back the Totem Baskets for putting, and introduced a new field game called the “Stego Smash” featuring the Reptilian Discs incredibly overstable putter the Stego. The challenge was to try to throw the Stego over 200 feet, which only 4 people were able to do! Unreal! The raffle table this year was loaded with stuff- and Paul Sales cashed in with 4 raffle items won. I guess that is what $60 worth of raffle ticket purchases gets you! We closed the day with a random doubles round using only the 3 trilogy discs. I am not sure how all the groups shot, but I know my card had a blast! 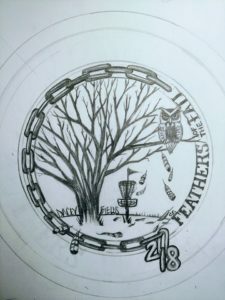 With no tags or no money on the line, we took full advantage of a round to just goof off, throwing off hand putts (Josh Garland buried a 60 foot birdie lefty on a tree bank shot) and some worst discs doubles! We want to thank all the players for coming out for another fun filled day!